A gentle side-to-side motion soothes baby best. 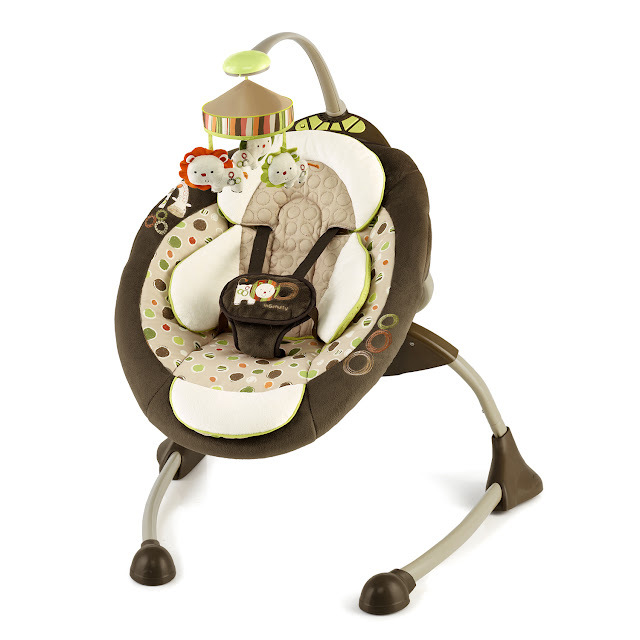 This unique sway is at the heart of this deluxe swing that features an ultra-comfy, cradling seat (adjustable to three positions), built-in mobile with adorable plush toys, 8 calming melodies or nature sounds, and TrueSpeed™ technology to maintain speed as baby grows. You can choose plug-in or battery operation—with the considerable energy savings and WhisperQuiet™ ride of our patented Hybridrive™. There's even a handy timer for automatic shut-off. Wrap it all up in sophisticated InGenuity™ styling and you've got yourself one irresistably cozy seat. 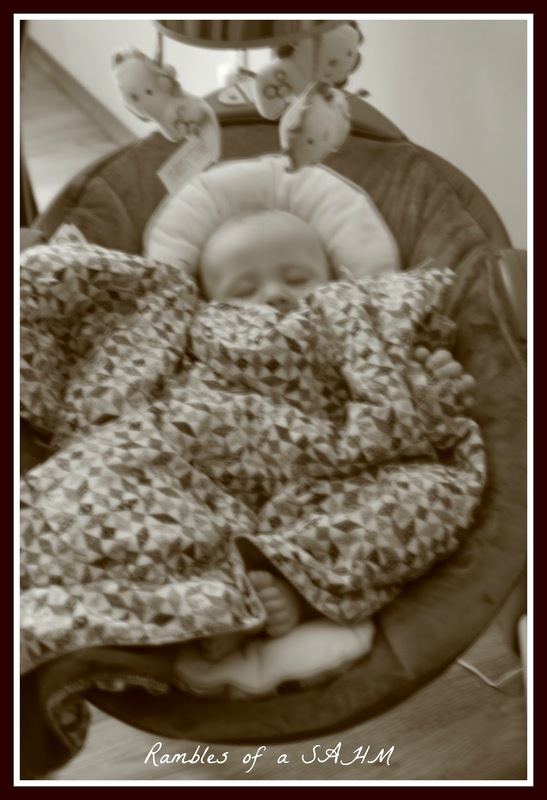 When I was given the opportunity to review the Cozy Coo Sway Seat I was very excited. I had seen several reviewers give it two thumbs up. Also our portable swing had just called it quits and I needed something to soothe Little H.
When the Cozy Coo Sway Seat came it was very easy to put together and only took a screw driver and two screws to assemble it. I love that the pattern matches our home décor and blends in well. The fabric is also very soft. There are many features of the Cozy Coo Sway Seat to love. Of course my favorite feature is that the sway seat plugs in. Our other swing did not plug in and I cannot tell you how many times it ran out and woke up baby. I honestly will never buy a swing again that does not plug in. I love that the seat vibrates and sways. It seems like the vibration keeps little H asleep for a longer period of time. It is also nice because the vibration can be used separately or at the same time as the swaying motion. Another stand out feature is that the seat has three different positions. This feature is great since baby likes to sit up and play and then when baby get sleepy you can change the position to lay flat. What really won me over was that Little H likes to play in the seat and sleep in it. In other swings he just wants to sleep and once he is done he wants out. I love that he takes his morning nap in the sway seat and then while I am making dinner he will just sit in the seat and play. If you have a heavy baby then you will love that TrueSpeed™ technology that adjusts to baby’s weight and does not slow down. 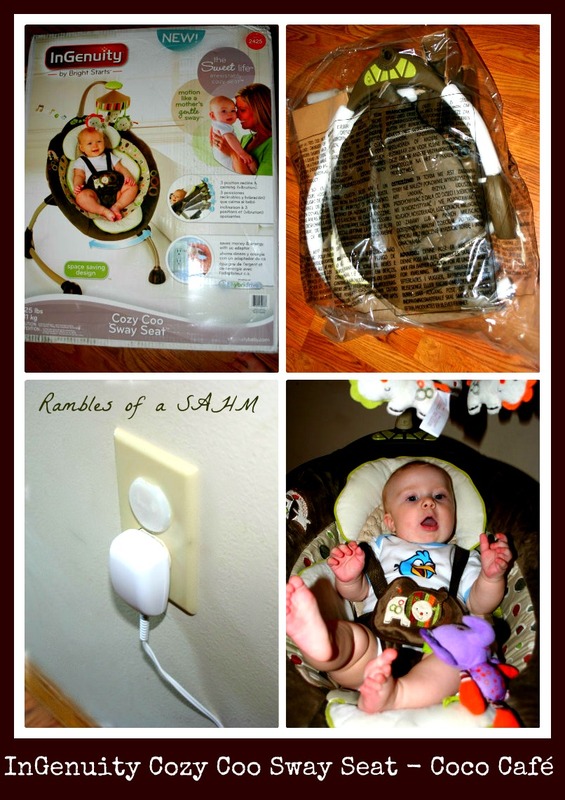 I was really impressed with this feature since our other swing seemed to slow down after baby got heaver. The only down side to this sway seat is that the toy hang down low and Little H can pull on them and I’m afraid he may rip it off someday. One other thing to consider is that the seat only sways from side to side and not back to front. I would recommend buying the Cozy Coo Sway Seat. I wish I would have had it right after Little H was born since it is so soothing and gives me time to get things done without him crying. You can purchase your own Cozy Coo Sway Seat in Coco Cafe at Target! I'd also love the Chair Top Highchair! Love the InGenuity SleepEasy Playard! I would love to have the InGenuity SleepEasy Playard. I also like the InGenuity™ SleepEasy™ Playard! I also like the InGenuity™ SleepEasy™ Playard. I like the cradle and sway swing. I like the high chair.Thanks for the chance. I like the Ingenuity Perfect Place High Chair. I LIKE THE THE SLEEP EASY PLAYYARD. I love the sleep easy play yards...and all the awesome colors they have! I love the Ingenuity Playard! The InGeunity Automatic Bouncer looks pretty nifty!! I like the InGenuity™ Automatic Bouncer™. I also like the chair top high chair! i love their portable swings. I like the play yard and high chair! I like the chair top high chair and any of the swings! I love the Chair top high chair! the InGenuity™ Signature Edition Automatic Bouncer looks awesome! I love the SleepEasy Playard!! I really like the InGenuity™ Smart & Quiet Portable Swing™! I like the cradle & sway swing. I love the InGenuity playards. My favorite is the Smart & Simple Playard! 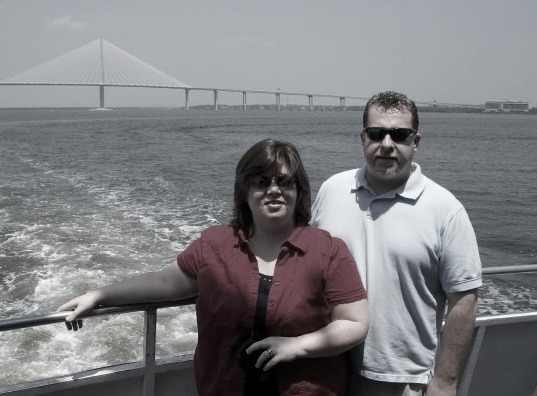 I would love to win one for my Son & Daughter in law who are expectin their first baby Aug. 24th. I would love to have the Ingenuity Automatic Bouncer. I just love the InGenuity Sway Swings and Sway Seats!!! 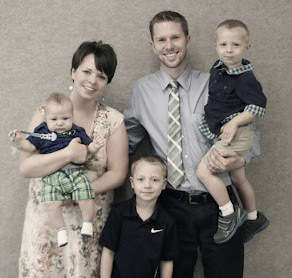 They really come in handy with fussy babies who fight their seat or just nead that extra motion to go to sleep. I like their quiet and portable swings too! I would love to check out the automatic bouncer!! I like the InGenuity™ Perfect Place™ High Chair. I like the Grow With Me Rocker. I like the Chair Top High chair! Love the cradle and sway swing!!! I like the InGenuity Signature Edition SleepEasy Playard. I like the InGenuity™ Smart & Simple Playard. I like the Sleep Easy Playard. I like the automatic bouncer. I like the Perfect Place High Chairs. I like the InGenuity SleepEasy Playard. I like the Portable Swing, thanks! I like the InGenuity Smart & Simple Playard. InGenuity Perfect Place High Chair. I like the Chair Top High Chair. 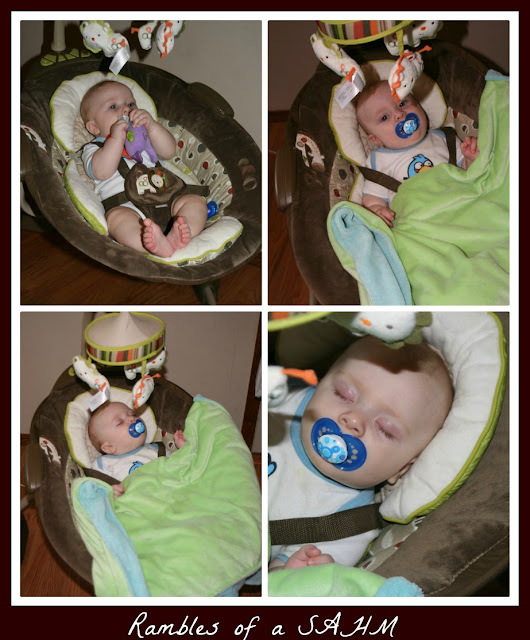 I also like the Smart & Quiet Portable Swing and the Smart & Simple Playard. I also like the InGenuity™ Automatic Bouncer™. I like the smart and quiet swing. I really like the bouncer. I like the InGenuity™ Signature Edition SleepEasy™ Playard!